Hi there and welcome to third edition of TLFG for the 2017/18 pre-season. UPDATE (18/07/17): After the rather threadbare offering I produced on Sunday night, here's the re-booted, fleshed out version. If you didn't see the original, I fell behind schedule because I spent last week on holiday in the central Turkish city of Konya. If you haven't been, it's packed with culture, history and lots of great food. One of the most striking things is that the overwhelming amount of visitors are Turkish meaning on the downside not many people speak English but conversely everything is really cheap. Not only was my flight and hotel package ridiculously good value (£285 for a week's B&B in a 5-star spa hotel with flight included) but all of the main attractions charged under £2 entrance for adults with some of them completely free. Kids never paid anything and playgrounds of really high quality were everywhere. 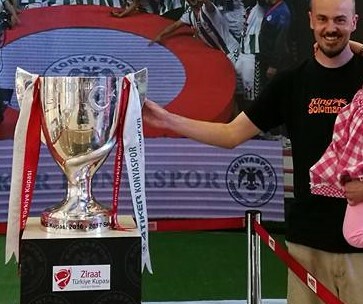 My personal highlight was of course football related and came in the form of getting my hands on the Turkish Cup which local side Konyaspor won for the first time last season and were parading in a local shopping centre. I also bought one of their third choice shirts for under £20 in the club shop where my daughter was fussed over and given not one but two club balloons to keep her entertained. I will definitely be keeping a close eye on their progress in this season's Europa League. This week the preparations for Non-League Day will start to hot up. I've got a meeting with Kick It Out on Thursday and need to upload lots of fixtures on to the event's match map so people can see what's on. I also hope to get to a game myself on Saturday with Carshalton Athletic v QPR U23s looking quite likely - a friend's teenage son has just signed for the host's first team so it could be a big afternoon for him. On my way back from Stansted airport yesterday I passed Tottenham's new ground which is going up impressively fast. If you're a Spurs fan or like a bit of football nostalgia, BBC reporter Chris Slegg has written a book all about White Hart Lane and included some great stories and anecdotes associated with the old ground which was one of my favourites. I've also been made aware that there are some websites out there charging people for advice on how to visit football matches here in England. Although there is absolutely nothing wrong with doing this, please be aware that I offer a very similar service for free so you could easily save yourself $50 for even the most basic information. There are over 100 matches in and around the London area over the next seven days with three Premier League and several EFL sides playing friendlies. In the following section I list what are in my opinion the most notable games of the week and give some brief reasons for my choice. Check the maps above for kick-off times, ticket info and directions. That's some good and brilliant news for the football fans. I hope that this season will be more thrilling than the previous one and hopefully it goes well till the end. Thanks for informing.